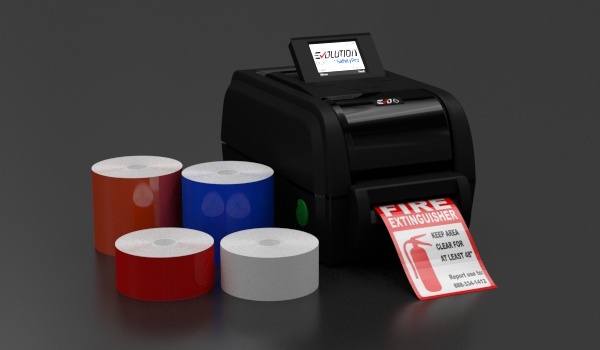 The SafetyPro Evolution 600, or Evo6 is the next evolution in vinyl label printing. At 600 DPI, it is the highest-resolution label printer available on the market today. The Evo6 includes on-screen diagnostics, even more rapid supply loading, and crisp, clean, high-resolution label printing capabilities. High-speed, high-resolution, and high-quality, the Evo6 is everything a label printer should be. The SafetyPro Evolution 600 prints fast, up to 4ips. Create clean, sharp, easy-to-read labels with a high level of detail. 600 DPI (dots per inch) is double the standard resolution on the market. At 600 DPI, you'll be able to create custom, ultra-fine detailed vinyl labels instantly. With USB, Serial, and Ethernet standard, the Evo6 is ready for your office environment. Print labels up to 100" in length (or longer with the cutter off!) in seconds. Label design is easy using the bundled labeling software, FacilityWare. Or, print directly from your own software, PDF files, SKM, Etap, Easypower, or many others. The Evo6 comes with a color LCD status screen, so you can instantly see how your printer is doing. The status screen will let you know if you have a loading error, or if you're out of ribbon. If you need custom, high-quality, high-resolution vinyl labels, then the SafetyPro Evolution 600 is the ideal printer for you. Contact us today at 877-762-9280 for more information, or order online! The SafetyPro Evolution 600 will reshape the way you view high-resolution labeling! This powerful, high-resolution 600 DPI printer lets you create detailed labels instantly, on durable vinyl labeling tape. As a leader in innovation, ISS has done it again! Call 877-762-9280 to order today!